Phil Foden scored twice tonight, as the young Englishman helped Man City overcome minnows Newport County to secure their place in the quarter finals of the FA Cup. Having already been 2-1 up thanks to goal from Foden and Leroy Sane, the youngster then bagged his second and City’s third late on in the match to secure the win for the away side. 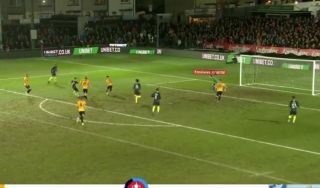 Foden’s goal came after the midfielder’s run towards goal saw him take on two Newport players before lashing the ball home, giving the opposition ‘keeper no chance. Great performance from the young Three Lions star. Here’s to many more in the future!